Action from ICA Sports v Netherton (red). Photo: David Lowndes. Premier Division leaders Netherton United had to fight back from two goals down to claim a point from their city derby at ICA Sports on Saturday (December 10). But it should have been an even better comeback as star striker Tom Randall struck the post from a late penalty. Netherton United's Rob Da Silva has eyes on the ball in the Peterborough Premier Division draw at ICA Sports. Photo: David Lowndes. Josh Smith scored twice for ICA early in the match before Jon Kerrison and Randall levelled the game for Netherton whose lead at the top has been reduced to one point. Reigning champions Moulton Harrox are the closest pursuers and they have a game in hand on Netherton. Harrox were comfortable 3-0 winners at Deeping Rangers Reserves on Saturday. Daniel Woods (2) and Joe Townsend scored their goals. Harrox host Netherton at Broad Street next Saturday (December 17) to decide who will be Christmas number one. Action from the Peterborough Premier Division draw between ICA Sports and Netherton United. Photo: David Lowndes. Holbeach United Reserves were also easy winners against Leverington, while bottom club Thorney’s improved form continued with a 1-0 win over Crowland. George Edwards, who has been converted from a centre back to a centre forward, bagged the only goal of the game 10 minutes from time at Campbell Park for a Thorney side who have won three of their last four games. Ketton and AFC Stanground Sports shared eight goals with Josh Staggs hitting a hat-trick for the city side and Nuno Marujo striking twice for the home team. Sawtry and Wisbech Town Reserves also shared the spoils in their fixture. Peterborough Sports Reserves powered their way through a PFA Senior Cup tie at Uppingham. Dan Drane, Carl Bird and Andy Boome all scored twice. Langtoft United secured a superb away win in the Lincs Junior Cup. They returned from a long trip to Scunthorpe & District side face Barnetby United with a 1-0 success under their belts. 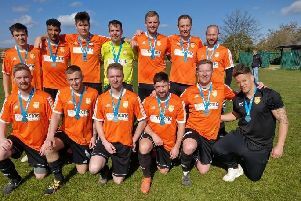 Ashley Firth scored the goal and Langtoft even survived a red card for Daniel Morris 30 minutes from time as they claimed a place in the quarter-finals for the first time in the club’s history. They will be joined there by Pinchbeck United. Oliver Maltby scored four for Pinchbeck in a 5-1 home win over Tetney Rovers. Stamford Lions were not so fortunate in the same competition, going down 3-2 at Coningsby United. Rob Forster scored twice for the Lions. Deeping Rangers Res 0, Moulton Harrox 3 (Woods 2, Townsend). Ketton (Marujo 2, Morley, Holmes), AFC Stanground Sports 4 (J. Staggs 3, McClean). ICA Sports (Smith 2). Netherton United 2 (Kerrison, Randall). Sawtry 2, Wisbech Town Res 2 (Coe, McKenna). Thorney 1 (Edwards), Crowland 0. Uppingham Town 0, Peterborough Sports 8 (Drane 2, Bird 2, Boome 2, Gellizeau, K. Gibbs). Barnetby United 0, Langtoft United 1 (Firth). Coningsby 3, Stamford Lions 2 (Forster 2). Pinchbeck United 5 (Maltby 4, Ogden), Tetney Rovers 1.